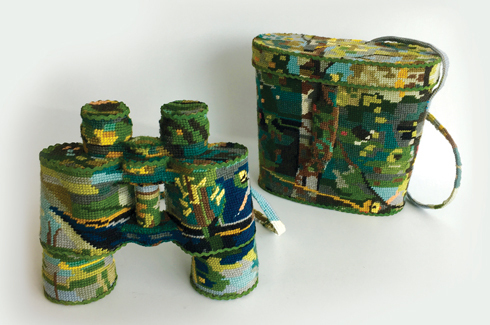 Swedish designer and artist, Ulla-Stina Wikander has found a novel way to breathe new life into obsolete household items; she painstakingly covers them with one-of-a-kind cross-stitch embroideries. This set was created for a meeting of ornithologists. If you look closely, you might just see some motifs pertaining to the science of bird-watching. 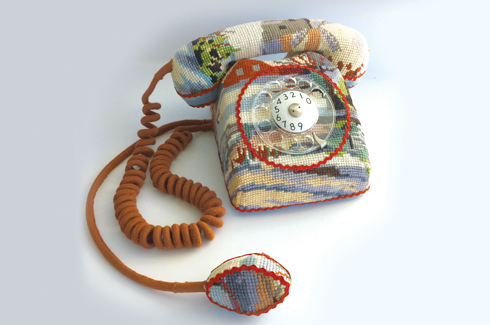 Sixty year old Ulla-Stina Wikander is a Swedish designer and artist who, by her own admission, “gives a second life” to objects and things that are forgotten and old by covering them with embroidery. In an exclusive interview with Home Review, the artist talks about her journey and love for cross-stitch embroidery. Wikander’s work-station masterfully reworked to depict the artist’s personality and profession. “To work as an artist,” Wikander begins, “is a very interesting profession, and I consider it to be an ongoing process.” An artist for most of her life, Wikander studied art for nearly seven years and worked at the Opera House in Gothenburg, particularly in scenography, props and interior design sections. “I have never wanted to be anything other than be an artist and I made the decision to become one when I was very young,” she adds. While working at the Opera House, Wikander would visit vintage stores and flea-markets to purchase props for the productions being staged. “It was here that I came across beautiful pieces of cross stitch embroidery,” she says. “Actually they were both beautiful and ugly at the same time,” she remarks about the uniqueness of the patterns she discovered. In no time at all, Wikander began to collect these patterns and embroideries. 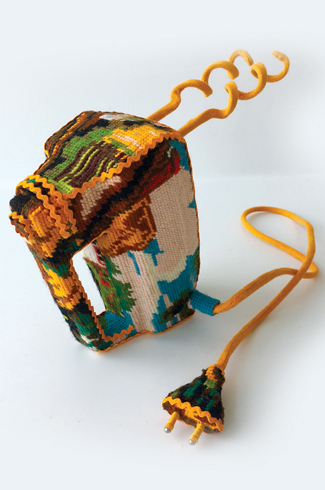 On an impulse one day, she decided to cover her broken vacuum-cleaner with embroidery. “I put the finished product up against a wall at home and observed my friends’ reactions to the same,” she goes on. The surprise on her friends’ faces was enough for Wikander to realise that she had given a new life to a discarded object. Anyone in the mood for ice-skating? Eventually, Wikander’s interest was piqued by household items that date back to the 1970s and were predominantly used by women. 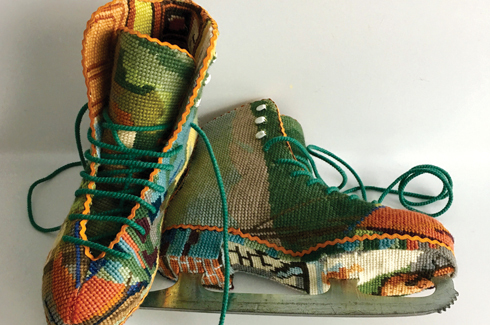 “I buy embroideries and objects from the same flea-market,” she explains of her process. “I pick out an object first, and then proceed to look for the right kind of embroidery.” As a mark of respect to the women who originally created the patterns and embroideries, Wikander tries to retain as much of the original pattern as possible in her refurbished piece. Choosing the correct embroidered piece may sometimes be a time-consuming process because you have to factor in various sizes and motifs. “It has to be clean, neat and must be of the right size to cover the entire object,” she remarks. Once she finds the right fit and design, the process of covering the object by sewing and/or gluing commences. 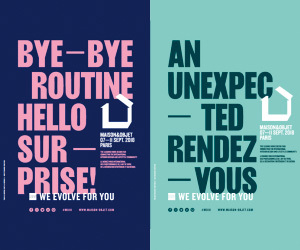 With mobile phones taking over communication, there’s no place in our lives for the good old telephone. Wikander gives the device a new life and makes it worthy enough to be a part of household décor once again. “Small objects like an iron or a telephone do not take me more than a day or two, to finish, but large installations take me a few weeks,” she adds. For larger installations, she prefers to use embroideries that depict flowers, elks, quaint red cottages, etc. ; ones that match the final picture she has in her mind. A self-motivated artist, Wikander believes that the opportunity to work with the things you love can be the biggest motivation in the life of an artist. “No one tells you what to do, so you have to be self-disciplined and make your own project,” she adds. With a collection of more than a hundred pieces, carefully crafted during the course of ten years, Wikander not only believes in going the extra mile when it comes to the surprise factor, but her craft also works towards establishing her philosophy of sustainable living. 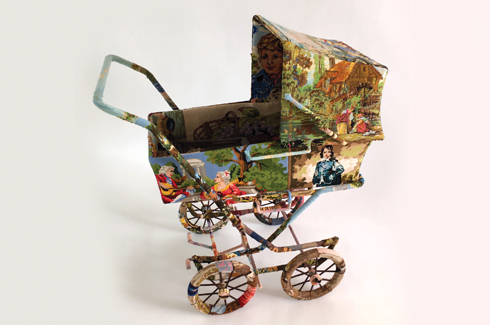 Embroidered remakes of some of the most famous paintings in the world have breathed life into this old stroller. is Pastry which is covered with intricate flower embroideries. “I love the fact that you can give a second life to objects and items that people generally tend to throw away,” she quips when asked about her obsession with old objects. According to her, the objects change character and take on a whole new meaning depending on the style in which they are covered. 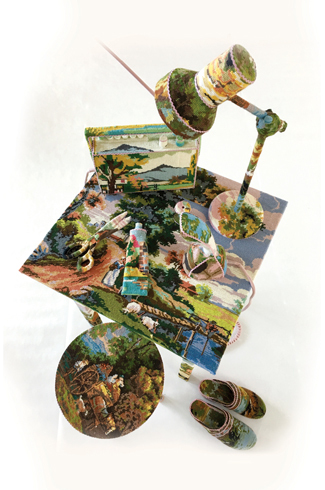 For us, each of her pieces can be part of a larger narrative – a story that the artist may be trying to narrate by way of colourful bursts and various patterns colliding together to breathe new lives into objects that have been discarded – just like Wikander’s own vacuum cleaner!